See that picture above? 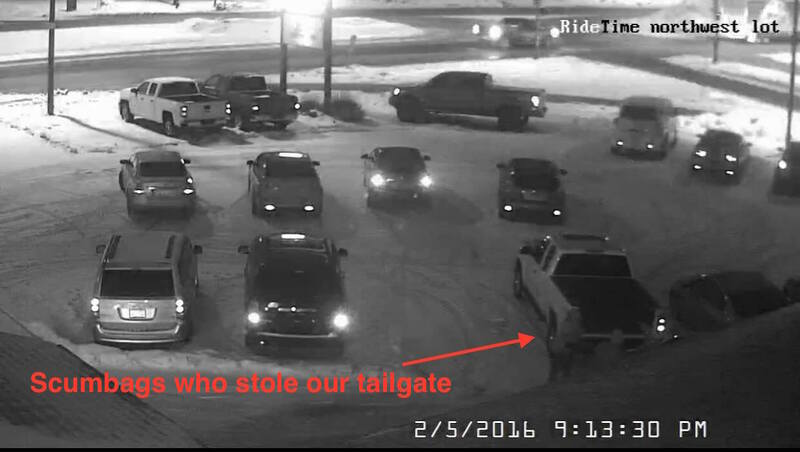 It was taken on the evening of February 5, 2016, by a security camera in the Ride Time parking lot. If you look closely, you can see three people — three scumbags — who are in the act of stealing a tailgate off our GMC Sierra. Yup. And this wasn’t the first time, either. We were so pissed, we took to Facebook the next day to enlist the public’s help in catching those lowlives. And actually, we were pretty blown away by everyone’s support. Thanks to your help, we were able to identify the thieves, and we’re now working out how we want to move forward. 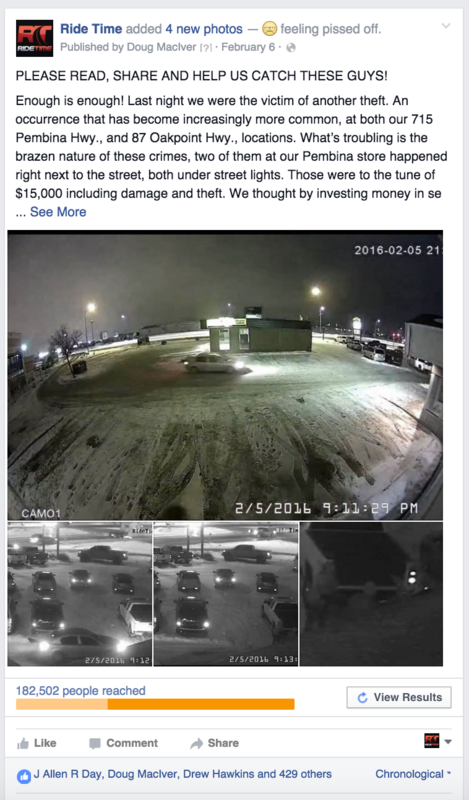 But in the meantime, we want to make sure thefts like this never happens again — not only to us, but also to any of who you might be vulnerable to tailgate theft Winnipeg. So how can we poor tailgate owners protect ourselves? Simple. By buying tailgate locks in Winnipeg. Why Buy Tailgate Locks for Used Trucks Winnipeg? Well, to protect against burglars, obviously. But there are several other reasons why tailgate locks are a good idea for used trucks Winnipeg. First of all, they’re not that expensive. You can get them for as little as $20 a pop. Second of all, there are different types of tailgate locks available. You can get the cheaper manual locks, or you can spring for the convenient key-powered ones, which lock and unlock your tailgate at the touch of a button. You can also get a generic brand or one that’s tailored to your truck’s specific make and model. If you want to take extra good care of your tailgate, visit our service center to shop accessories for used trucks Winnipeg. We’ve got tailgate parts and tons more. Don’t Miss a Minute of Our Crazy Shenanigans! If this is the first time you’re hearing about our tailgate scandal, you’re clearly not following us on social media. Obviously, we hope nothing like this ever happens again, but if it does, our fans on social media will be the first to know. That’s because we talk about everything — and we mean everything — on social media. We’re sort of obsessed. If you want to make sure you don’t miss a minute of all the crazy goings-on at Ride Time, be sure to follow us on Facebook, Twitter, Google Plus, YouTube, and Pinterest. Bonus points if you follow all five!